1804 Napoleonic War Letter from London to East Sheen mentions "...AT TIMES THE RUMOURS ARE DESPERATE, BONEY BEING AT BOULOUGNE AND 100 BOATS HAVING BEEN OUT TO TRY THEMSELVES ON FRIDAY MORN..." etc, showing on the front, a fine Two Penny/Post/Strand C O. 1831 Entire to Truro giving a valuation of Lord Clinton's Grounds and including a coloured drawing of same, showing a very fine FALMOUTH 'TOO LATE' in Red, CO 83. Interesting content. 1661 Dec 11th. 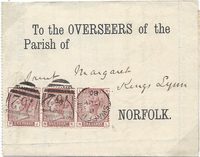 Entire from YARMOUTH carried privately and addressed "To Mr Thomas Pengelly Mercht at Mr Richard Bendicks in NORWICH and "with 3 porkes". 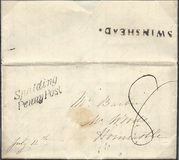 1839 Entire addressed to Malton, York showing on the reverse a Type 5 STILLINGTON/PENNY POST, YK 2839 - RARE BEFORE 1840. Letter refers to Tolls on the York/Scarborough turnpike road. 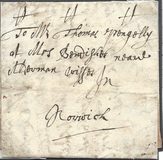 1670/4 A fine example of Court Penmanship listing "Sir John Moore's answer to the charges against him as to the selection of Sherriffe", re Sir Dudley North. 1826 FIRST ANGLO-BURMESE WAR, large part entire describing THE BATTLE OF PROME, addressed to London showing a fine boxed INDIA LETTER/WEYMOUTH, Robs IN2. 1807 A Very Interesting Entire from JOHN CRAWFORD who emigrated to Baltimore from Ireland in 1796. He was highly respected for his contribution to the doctrine of contagious disease. 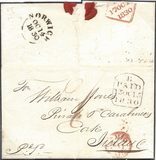 Addressed to London and redirected to his friend Hugh McCalmont in Ireland, a landowner and banker. 1810 Entire from Southampton to Kerrimuir, Scotland. Letter mentions a boat trip from Southampton to Spithead and attempting to board a larger ship - the small boat was sent to the bottom! One was unable to swim and had to be rescued and INSTEAD OF THANKING HIS SAVIOUR, EXCLAIMED, "T'WAS A HELL OF A DOSE"!!! 1771 Entire from CHARLESTOWN, JAMAICA TO LONDON "pr The Ship Peter & Ann Thomas Blundell Master", regarding the importing of wine, showing a very fine PORTSMOUTH/SHIP LRE, Robs S 2.